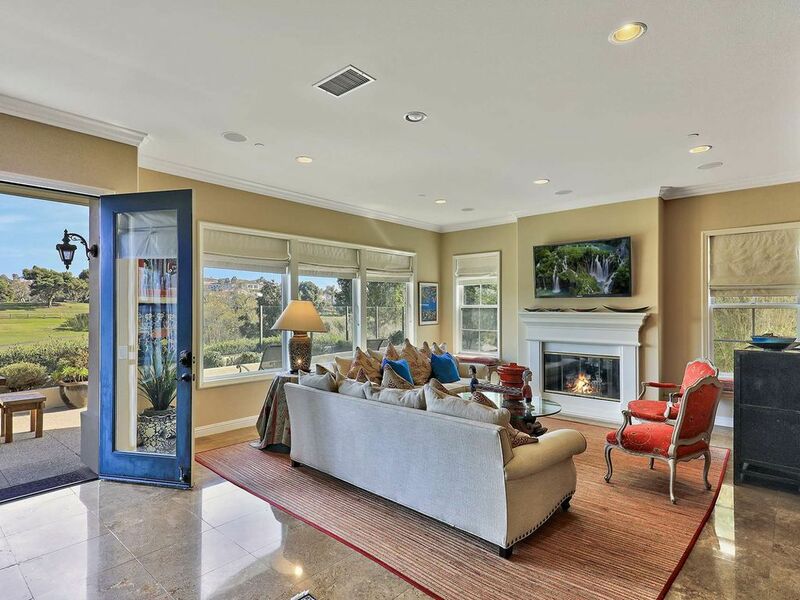 Artfully decorated spacious home in exclusive gate-guarded community of Pointe Monarch. Steps from the St. Regis Hotel with wide open views of Monarch Links Golf Course. Stroll along the golf course walking path to Strand Beach. Enjoy over 4500 square feet of living space with 4 bedrooms, 4.5 baths, gourmet kitchen and bonus/game room complete with pool table and foosball table. Pacific Rim inspired art and collectibles designed to blend together with Mediterranean charm. This magnificent home in the gate-guarded community of Pointe Monarch is decorated to blend the treasures of Asia and the Pacific Rim together with the newer style Mediterranean design of the home. Artfully appointed with sculptures, paintings and collectibles from Tibet, Singapore, Hong Kong and the South Pacific. With over 4500 square feet of living space featuring a formal living room, dining room, family room and gourmet kitchen every detail shows off the quality workmanship of the home. Crown moldings, granite counters and bath, travertine floors and an open floor plan make this a comfortable retreat for long term stays. Entertain in the upstairs bonus/game room complete with pool table, foostball table, and wide-screen TV viewing. Four generously-sized bedrooms complete with full bathrooms attached; one bedroom downstairs, 3 upstairs with a huge master suite and romantic fireplace, and private balcony panoramic views. Fireplaces add ambiance to the family room and living room. Intimate interior courtyard off dining room and living room. Private bathrooms attached to each bedroom with a half bath downstairs. Master bath with island spa tub, steam shower, bidet, separate dual sinks and large closest. Soak in the tub while watching the flat screen TV. If work is necessary, there is plenty of room in the den off the Master suite. Home has wireless internet, flat screen TV's in all rooms, and a central sound system that pipes in music in every room. Nothing is missing in this exquisitely built and decorated home. The walking trail takes you along the golf course to the beach in minutes. Excellent location with an easy stroll to shops, restaurants, dining and all Monarch Beach has to offer. Laguna Beach just a mile away and Dana Point Harbor a mile to the south. Easy access to San Diego and LA and all major attractions. Perfect stay for our spring break trip. The property was very clean and well maintained. We would definitely stay here again. The location of this house, overlooking a golf course and within a 7-10 minute walk to Salt Creek Beach, was just perfect. Very close to the Monarch Beach Resort and the Ritz Carlton Laguna Niguel (the latter about a 20 minute walk). Our family spent the Christmas week here and we really could not have asked for a nicer house to stay in. The 3 guest bedrooms were nicely sized and very comfortable, while the master bedroom was enormous. The kitchen was very well equipped, and combined with the family room/tv area, was just super for our group of 7. We made good use of the outside seating area, the pool table and foosball table too! We would come back in a heartbeat and have already recommended it to other family members. Beautiful "home away from home"
This lovely home provided the perfect “home away from home” for our family as we celebrated our son and daughter-in-law’s wedding. The spacious kitchen/family room served as our hub where we shared meals, wedding preparations and many hours of family time. Each of the bedroom suites afforded our family luxury as well as privacy during this vacation/destination wedding. The perfectly tuned piano was played daily by the groom’s father both for fun and in preparation for playing the bride and groom’s first dance. The second floor game / entertainment room provided hours of additional enjoyment. The amenities in this lovely home are top notch. It was pristine clean upon our arrival and we easily found everything we needed. The rental agent was knowledgeable, very responsive to our questions and extremely friendly. Carla even provided a brand new pack-n-play for our grandson when we requested if one was available. If the opportunity comes along in the future, we would book this beautiful home for our family again and again. Our family has been renting this beautiful home each time we stay in Southern California. It is perfect for families. The house has everything you could possibly need as well as a fantastic pool table and foosball table to keep the kids occupied. The property is extremely well taken care of and the location is walking distance to the beach with a beautiful view of the golf course. The neighborhood is very quiet and it is nice to be located so close to a shopping area and many restaurants. We always look forward to planning our next trip and staying here. The property manager makes it so simple and we always feel welcome! We are so happy to have had the pleasure of staying in this vacation rental! It is the ideal place to get away from it all - location, décor, warmth, and livability really make this house special. As a family of four with two small children, the home offered many of the amenities we look for when traveling. The retreat is located in an upscale, quiet, gated community and is conveniently located within walking distance to the beach, as well as a gourmet grocery store and restaurants. The home offers many different options in terms of entertainment including a pool table, foosball, video gaming systems and board games. There was always something fun to do – including just spending time together in the house. Our family was entertained throughout our entire stay. The retreat is also located halfway between both Legoland and Disneyland – each being a quick 45 minute drive. We were able to enjoy both parks during our time there. The house is spacious with four oversized bedrooms, each with its own private bathroom, which is truly a luxury and not often found in most rentals. The master suite offers beautiful views of the golf course below, private balcony, spa tub, steam shower, dual sinks, and walk in closet. We were able to cook all of our meals in the large gourmet kitchen, barbecue on the patio, and enjoy beautiful sunsets and sea breezes. We could not have been more comfortable at the retreat, and being from Phoenix, it was the perfect escape from the Arizona heat! We would highly recommend this house to anyone looking for a Dana Point getaway. Thank you for taking the time to share your feedback! We strive to make it a special home and glad it worked for you. My husband and I have been renting in this area for the last 3 years and this has been the best location we have stayed at so far. The property was beautiful and well maintained. It was in a great location, minutes from the beach with a wonderful view of the golf course and close to shopping and dining. We loved our stay here and look forward to working with this management company again soon. Vacation in Laguna Beach and experience coastal beauty and exciting attractions. iTrip Vacations Laguna Beach offers a variety of vacation rentals in Laguna Beach, Dana Point and San Clemente, California. With tropical landscape, stunning beaches and beautiful weather year-round, this section of the California coastline provides a perfect vacation destination that will leave you refreshed, relaxed and wanting more. With over 340 days of sunshine annually, world-class beaches and things to do, our rentals provide access to both small-town and big-city attractions. Situated between Los Angeles and San Diego, you'll want to try some of the best restaurants, shopping and recreational activities found on the West Coast. Laguna Beach offers the best of both worlds. Our rentals serve as a place to relax and explore all the Pacific Coast offers without having to stay in busy areas. Nearby, you'll find Disneyland, Sea World, San Diego Zoo, Knott's Berry Farm and Universal Studios. For outdoor activities, visit the tide pools, kayak among dolphins, golf in the canyon, and enjoy world-class spas and shopping. Dana Point Harbor has all types of water activities, and San Clemente attracts professional and amateur surfers who enjoy fun events and competitions. At the end of the day, catch a sunset from your balcony and watch the sun dip below the horizon. For art lovers, Laguna Beach also hosts world-famous events such as the Pageant of the Masters, Sawdust Festival and Art-a-Fair outdoor festivals. Local artists are featured in galleries and on a monthly art walk all year-round. Other events include music, dance, painting, skimboarding and holiday celebrations. iTrip Vacations Laguna Beach manages several different rental options – from private beach homes to beachfront condos – all situated near the Pacific Ocean's pristine blue waters. Browse Laguna Beach vacation rentals and plan your escape! Learn about our Laguna Beach property management services. Major Credit Cards Accepted. Monthly rates show the rental amount of a four week trip. A 35% deposit is required upon confirmation of all reservations. Local, State & Federal Taxes 10%. Processing Fee $49 per trip. Refundable Security Deposit $2,500 per trip refundable after cleaning and inspection.